Don't miss out on one of the biggest and best events around!! Championship singlets for the winners in Folkstyle, Triple Crown awards (must have more than 4 in each bracket to be eligible for Triple Crown), Outstanding Wrestler in each division and much more!! To book your room please call the hotel directly at 208-237-1400 or email Marisa at marisa@clarionpocatello.com. You need to mention you are with the USA Wrestling room block. Rates are $105/night for a double queen or $89/night for a single King. To book your room please call the hotel directly at 208-234-0888 and tell them you are coming for the wrestling and you will get the rate of $99/night. We are looking for 30 officials for this event. If you are interested in officiating at the Western States please check out the flier below and let us know! Custom medals for top 6 place winners. 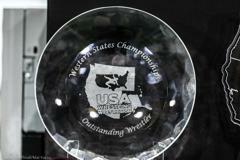 In the FOLKSTYLE division your champion will receive a Western States "Champion" singlet as shown above. Triple Crown awards for all those that win all 3 styles (must have more than 4 in each bracket to win Triple Crown award) and Outstanding Wrestler awards for each division and style. You may double bracket up a division using same weigh in weight. You may not be in two weight classes inside the same division. Double bracketing can only be done at the head table after weigh ins. No double bracketing is available for Folkstyle as all divisions are competing at the same time. To participate in early weigh ins you must pay a $10 fee which you will bring with you and pay at time of weigh ins. We are looking for table help each day. The pay is $100 per table and 2 people are required per table. If you are interested in running tables please reach out to Jeff Newby via email at Jeffreynewby@wrestleutah.com.